THE GREAT BARRIER REEF, located on the northeast coast of AUSTRALIA, is comprised of the world’s largest cluster of coral reefs. It is 1,250 mi (2,012 km) long; running along 10 mi (16 km) of the eastern Australia shore in the north to 100 mi (161 km) in the south. Its length is comparable to that of the entire West Coast of the continental UNITED STATES. 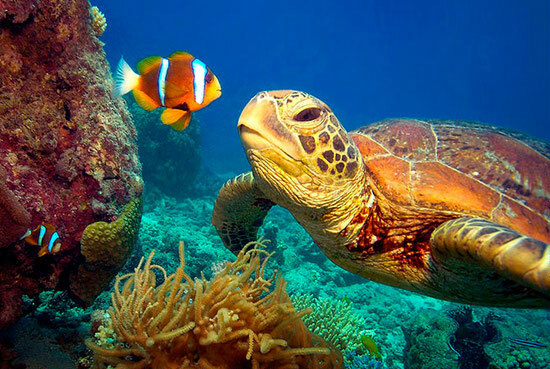 The Great Barrier Reef is an example of the key stages in the Earth’s continuing ecological and biological evolution of natural phenomena and habitats. The Great Barrier Reef’s diversity shows the development of an ECOSYSTEM that has evolved over hundreds of thousands of years. It is the world’s most extensive coral reef system and is one of the world’s richest areas in terms of plant and animal uniqueness. There is more than just coral to the Great Barrier Reef. It also contains widespread areas of sea grass, mangrove, soft bottom, and island communities. The reef is not a continuous barrier, but a broken maze of coral reefs and cays (ledges). There are approximately 2,800 individual reefs, of which 760 are fringing reefs that form against or near an island or continental coast and grows seaward, sloping sharply toward the seafloor. The Great Barrier Reef provides habitats for abundant forms of marine life. The reef is the largest structure ever built by living creatures, and consists of thousands of separate reefs, islets, and islands. The reef contains approximately 1,500 species of fish, 400 species of sponges, 4,000 different types of mollusks, and approximately 400 species of hard, reef-building corals. The coral is a growth of calcareous (calcium or calcium carbonate) remains accumulated over a period of some 25 million years. The marine life of the warm, clear waters of the reef is plentiful and varied, consisting of anemones, marine worms, gastropods, crayfish, lobsters, prawns, crabs, starfish, sea urchins, and a great variety of fish and seabirds. Among the better known species are the crown-of-thorns starfish (Acanthaster), the giant clam (Tridacna gigas) the deadly box jelly, sea wasps, and many brightly colored fishes. The reef also supports a wide variety of fleshy algae that are eaten by the resident turtles, fish, sea urchins, and mollusks. The reef is the habitat of such endangered species as the dugong sea cow and the large green loggerhead turtle. The reef sea-grass beds are an important feeding ground for the dugong and are a nesting ground for the loggerhead turtles. It is also a breeding area for humpback whales, which come from the Antarctic to give birth to their young in the warm waters. The islands and cays support several hundred bird species, many of which have breeding colonies there. Reef herons, osprey, pelicans, frigate birds, sea eagles, and shearwaters are among the numerous sea birds that have been recorded. The Great Barrier Reef Marine Park was acknowledged in 1975 with the purpose of preserving the area’s outstanding biodiversity while allowing reasonable use for local economy through zoning laws. The environmental risks related to shipping within the Great Barrier Reef are operational pollutants and accidental pollutants, the major threat being from oil, either carried as fuel or cargo. There are over 30 historic shipwrecks in the area, as well as a scattering of islands ruins, operating and historically significant lighthouses, and World War II sites. Captain James Cook is believed to have been the first European to encounter the reef when his ship the Endeavour ran aground on it in 1770 near what is now Cooktown. Human involvement with the Great Barrier Reef began thousands of years before Captain James Cook encountered the reef. Aboriginal peoples and Torres Strait Islander communities have fished, hunted, and gathered from its waters, islands, and adjacent coastal areas for thousands of years. These people have significant traditional cultural connections to the Great Barrier Reef. The many important cultural sites that are evidence of past and in some cases contemporary activity are one aspect of their living cultural heritage that exists across the islands and reefs in the Great Barrier Reef Region. The hunting of marine animals such as dugongs and turtles has long been part of Aboriginal culture, and these activities continue as part of the cultural heritage. Chinese fisherman and Japanese pearl divers also frequented the waters of the reef in the 19th and early 20th centuries.